After high volatility and sharp declines at the end of the fourth quarter of 2018, global stock markets rebounded strongly in the first quarter of 2019 and ended with a gain of 12.2%. 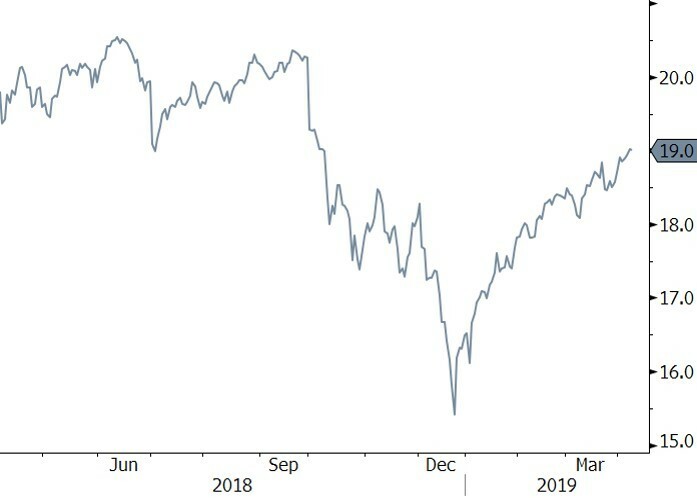 Despite this impressive recovery, the global stock market is actually still lower than it was at the end of the third quarter of 2018. While the 2019 stock market surge implied economic optimism, the bond market sent a different message. Longer-term bond yields continued to fall over the first quarter, with the United States Treasury 10-year yield ending the quarter at 2.4%. Typically long-term yields rise when investors’ growth expectations and/or inflation expectations rise, and fall when investors become more cautious and/or inflation figures decline. At quarter end, the yield curve inverted, meaning that the yield on 10-year Treasuries was lower than the yield on 2-year Treasuries. An inverted yield curve has historically been an important signal of future economic difficulties. 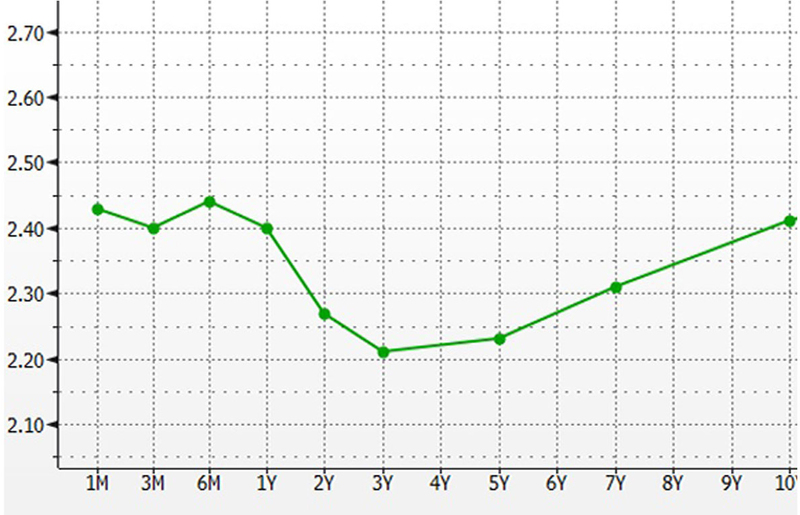 As shown in charts 1A and 1B, yields on the 10-year Treasury fell sharply, leading to an inverted yield curve. 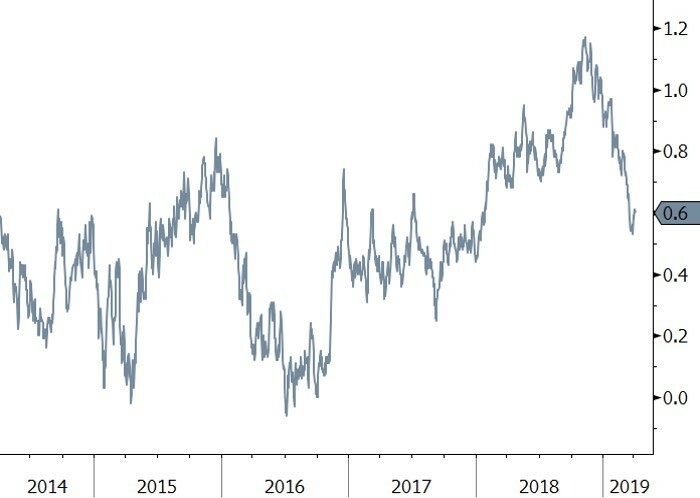 Conversely, stock market investors have bid up share prices and equity market multiples, or what an investor is willing to pay for each dollar of earnings, have risen accordingly as shown in the chart 1C. This is with a backdrop of a projected decline in company earnings in the first quarter. Stock market investors are willing to pay significantly more for today’s earnings than they were in December, and the current S&P 500 price to earnings multiple of 18.4 times is also higher than the long-term market average of 16 times earnings. In our view, this indicates a renewed optimism in the market about companies’ prospects over the next 12-18 months. Stock market investors seem to be wagering that the current slowdown will be short and that aided by easier central bank monetary policy, the economy will soon regain strength making stocks attractive even at these relatively elevated prices. They expect the Federal Reserve will soon cut interest rates to stem an economic slowdown, thus bringing down yields at the short end of the yield curve. All these rationales point to why yield curve inversion is atypical and historically presages a recession. We have seen some signs that this may be the case, as global yields have declined around the world and global economic conditions have slowed as well. For example, in the U.S., Q4 GDP estimates have declined from 2.6% to 2.2%, and forecasts for Q1 are even lower. Based on the Atlanta Fed’s GDPNow forecasting model, current expectations for Q1 GDP growth began to fall in Q4 2018 and are currently just over 1%. In addition to slowing GDP growth expectations, there are also additional strong reasons for bond investors’ caution. First, the benefit to the U.S. economy from the 2018 tax cut is expected to wane in 2019 and will ultimately reverse to become a detractor to GDP growth in 2020. Second, geopolitical uncertainty is high. For example, we do not know how the U.S.- China trade conflict or Brexit will be resolved. Other important indicators are also flashing yellow: labor markets are very tight, recent wage growth may compress company margins and affect earnings, and the unemployment rate troughed at 3.7% in November 2018 and has risen marginally to 3.8%. A rise in unemployment, even from a very low absolute level, has typically been a precursor to a recession. 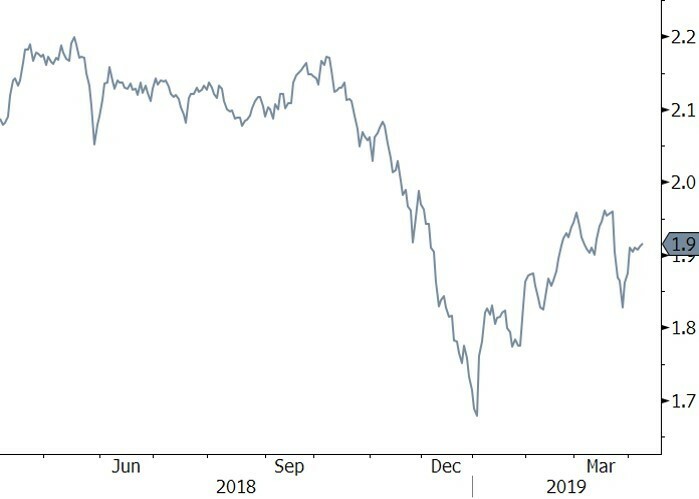 As a result of these negative catalysts, our view is that potential global stock market upside after the first quarter is probably more limited than the potential downside. Our conservative positioning served us well in 2018 and we believe it is best to maintain this stance in 2019. The Federal Reserve has certainly taken notice of the economic slowdown as well. In March, it reiterated that it would pursue a “patient” monetary policy, and their recent pause in interest rate increases was a key catalyst for the recent stock market upswing. 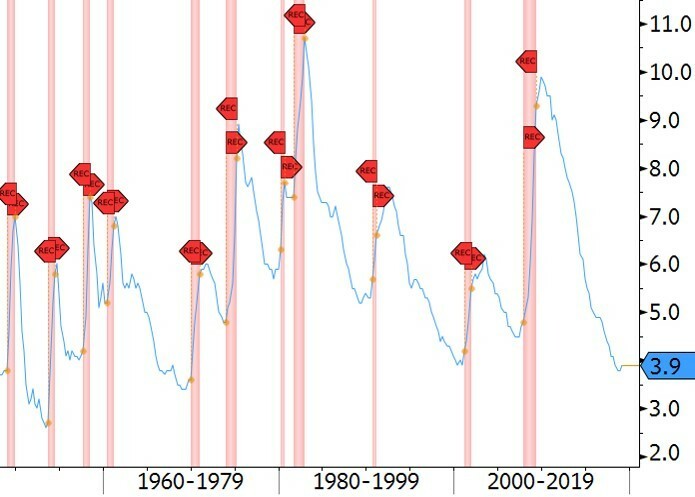 Although short-term interest rates are set by the Federal Reserve, long-term interest rates are determined by the market. As mentioned previously, typically long-term yields rise when investors’ growth expectations and/or inflation expectations rise, and fall when investors become more cautious and/or inflation figures decline. By subtracting the real yield of an inflation linked bond from the nominal yield of Treasuries, markets imply a certain expected inflation rate for that particular period. 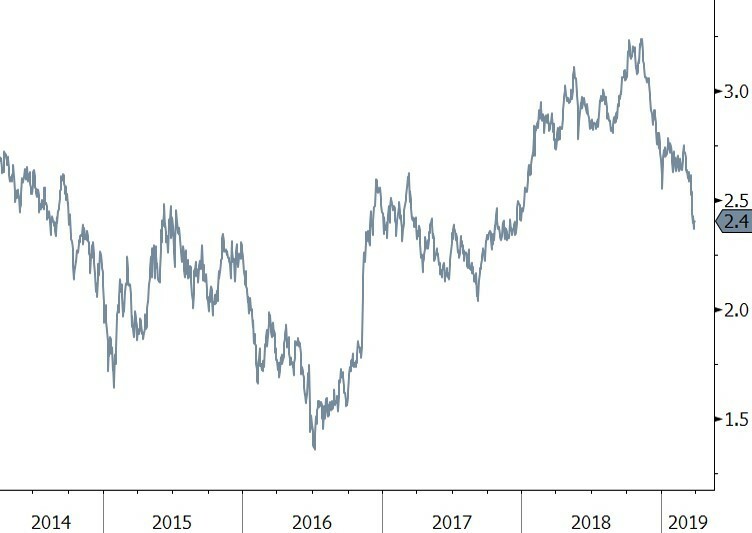 Using this calculation, chart 1F shows the implied 10-year inflation rate. 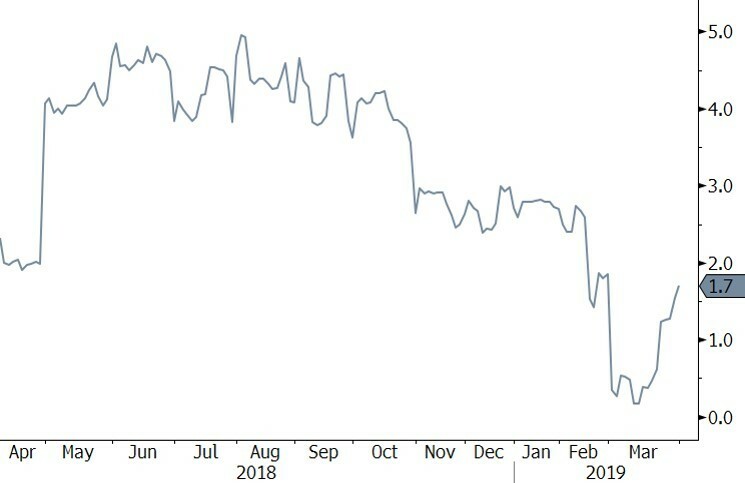 Although inflation expectations are lower than this time last year, we can see that inflation expectations have actually increased since the beginning of the year. This means that real yields have declined (since, as we have previously discussed, the overall yield on 10-year Treasuries has declined). In fact, after steadily rising since early 2016, real yields began falling in later 2018 and have continued to decline this year. Before the financial crisis, the U.S. economy supported real yields of over 2% without those yields dragging on the economy. In 2018, despite real yields barely surpassing 1%, the U.S. economy slowed to such an extent that Federal Reserve officials rushed to change their policy position. The economy’s inability to support a 2% real yield indicates relatively poor long-term returns for bond and stock investors. It is not clear how long the slowdown will persist nor how deep it will be. As we described, bond market investors think the slowdown will continue and will require further easing from the Federal Reserve. The rebound in equity price to earnings multiples from the December lows means that further upside for stocks will need to stem primarily from earnings growth. However, our view is that with the corporate tax cut behind us and margins already at record levels, earnings growth will be muted. If the bond markets are correct and the economic slowdown persists, stocks will see earnings continue to decline as well as multiple contraction, meaning investors are willing to pay less for each dollar of earnings produced. This is why we remain conservatively positioned. We remain invested in our high conviction ideas and plan to await a future opportunity to deploy capital back into equities. Although global equity markets are down over the past 6 months, returns for the past 12 months are back to being slightly positive. This is a good time to assess your personal circumstances and consider whether your current portfolio risk target continues to make sense. If Q4 2018 (and December in particular) was highly stressful, now is a good time to rethink your long-term strategic risk positioning and take advantage of the first quarter rebound. This report is prepared by Choate Investment Advisors LLC (“ChoateIA”), a subsidiary of Choate, Hall & Stewart LLP. ChoateIA is registered as an investment advisor with the Securities and Exchange Commission. Registration does not imply a certain level of skill or training. More information about the firm can be found in its Form ADV Part 2, which is available upon request by emailing info@choateinvestmentadvisors.com. This presentation is for informational purposes and does not constitute investment advice. None of the information contained in this report constitutes, or is intended to constitute, a recommendation of any particular security, trading strategy or determination by ChoateIA that any security or trading strategy is suitable for any specific person. Investing involves the risk of loss of principal. To the extent any of the information contained herein may be deemed to be investment advice, such information is impersonal and not tailored to the investment needs of any specific person. The opinions expressed are solely those of ChoateIA. The information contained in this report has been obtained and derived from publicly available sources believed to be reliable, but ChoateIA cannot guarantee the accuracy or completeness of the information. Past performance is no guarantee of future results.